8th grade students and their teacher examine the role of propaganda in New York’s Holocaust Curriculum Lesson Plan 2: The Rise of Nazism. New York’s Holocaust Curriculum is a new educational resource representing an unprecedented expansion of our mission to educate students about Jewish life before, during, and after the Holocaust. 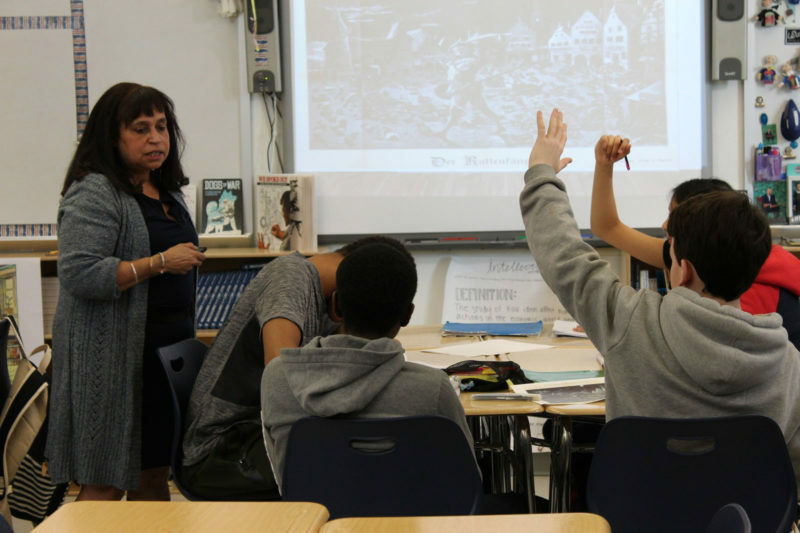 Developed by the Museum with the support of the NYC Department of Education, New York’s Holocaust Curriculum is an innovative teaching resource featuring free lesson plans accessible through our Meilman Virtual Classroom, primary sources, and other resources for middle and high school students and their educators. New York’s Holocaust Curriculum will help us reach students throughout the five boroughs in their own classrooms. Our curriculum incorporates best classroom practices and draws on artifacts from our Museum collection. Our Standards are aligned to the Common Core, as well as the New York City Scope and Sequence for Social Studies and NYS Next Generation Learning Standards. Please share this online resource with educators, librarians, parents, and students in your community: HolocaustCurriculum.nyc. The Museum has created Holocaust education lesson plans using the HBO documentary The Number on Great-Grandpa’s Arm as its source material. These lesson plans—also available through Scholastic—help teachers, and parents, introduce the Holocaust in an age-appropriate manner. Lesson Plan for Grades 3 – 5: Students will understand some basic elements about life during the Holocaust. Download a free copy. Lesson Plan for Grades 6 – 8: Students will understand important themes and topics for studying the Holocaust. Download a free copy. The Museum offers several opportunities throughout the year for active classroom teachers and is an approved Sponsor of Continuing Teacher and Leader Education (CTLE) by the New York State Education Department. To view upcoming programs, visit our Events calendar and sort by “Teacher Professional Development”. The materials described below are published by the Museum’s Education department and are designed to meet state standards and the Common Core standards. Please click here for more information about how our curricula and programs meet the Common Core standards. Download a free copy. Explores themes of language, community, work, and social activism through the use of primary documents. Includes a section on U.S. immigration during the Holocaust. Aligned to the New York City Scope and Sequence for Social Studies, as well as the Common Core State Standards. A Free, Multimedia Website Curriculum Resource. Grades 6 – 8. Discover this free, multimedia website that helps middle school students learn about the Holocaust from the stories of young people who survived. Through online discussions and engaging activities, students gain a personal connection to history and explore issues of ethics and personal responsibility. The site integrates 13 first-person accounts of Holocaust survivors told through video, narratives, and primary documents. These are accompanied by writing, history, and geography activities; primary sources and artifacts for interpretation; online discussions; and suggested research projects. Coming of Age is aligned with the National Standards for World History and NCTE Standards for the English Language Arts for Middle and Secondary Schools. Each year, the Museum receives requests from teachers for support in planning meaningful Holocaust commemoration ceremonies at their schools. The Zachor Guide contains detailed instructions about planning a ceremony as well as various resources. This Teacher’s Guide accompanies the compelling book by Holocaust survivor Fanya Gottesfeld Heller. This autobiography is well suited for use with high school students in History or English classes because of its broad scope of the Holocaust and the genre of memoir. This Teacher’s Guide offers questions and activities for each chapter and incorporates study of artifacts. Some of the themes teachers explore with their students are: Jewish identity, encountering the Nazis and their collaborators, defiance against the Nazis, rescue, and the end of the war and its aftermath. This curriculum focuses on the young adult book of historic fiction, Friedrich (first published in German in 1961; Puffin Books, 1987). Friedrich provides a starting point for developing an understanding of the events, issues, and personal crises faced by all those living in Germany in the years 1930 to 1942, particularly 1930 to 1939. It can be used by the teacher as part of a more extended study of Holocaust history or Holocaust literature, or stand on its own as literature. In the late 1930s few countries were willing to accept Jewish refugees. One nation—the Dominican Republic—opened its doors. Jewish settlers established a small agricultural settlement in Sos̼a that still exists today. The Museum created a bilingual exhibition, in English and Spanish, showing how settlers were recruited, how they came to Sos̼a, what awaited them there, how the settlement grew, and the evolution of this small Jewish community. The Teacher’s Guide, originally developed to correspond with the exhibition of the same name, lesson plans with worksheets in English and Spanish, background information about Jewish life, anti-Semitism, and the Holocaust, and a chronology, glossary, and bibliography. Student worksheets include: To Stay or To Go? / ¿Quedarse o irse? ; Building a Society / Construir una sociedad; Establishing a Successful Economy / Establecer una economía exitosa; Pastimes and Cultural Life / Pasatiempos y vida cultural. Originally designed to aid teachers in preparing students for a visit to the special exhibition, Daring to Resist: Jewish Defiance in the Holocaust. Includes lesson plans for all schools, including those designed specifically for Jewish schools, and a list of additional resources. The activities are designed to encourage students to think about the range of Jewish response and resistance during the Holocaust, reflecting acts to maintain dignity, document the unimaginable, save lives, and resist with arms. All for purchase via publications order form. Explores American involvement in the Second World War from the home front to the front lines. Includes a chronology, timeline, glossary, and pre-visit activities for students. Workbook that explores the topics of heritage, anti-Semitism, and resistance within the context of the Holocaust. Includes a Holocaust chronology, glossary, and pre-visit and post-visit activities for students. Designed to show younger children how objects can teach us about heritage and family traditions. Workbook for students to explore themes of art and symbolic or spiritual resistance during the Holocaust. It depicts life in the Terezin (Theresienstadt) ghetto and Nazi deception through examination of a teenage artist’s drawings and other primary documents. Includes a chronology and glossary. Fun family guide with Museum and at-home activities to help younger children use artifacts to learn about their family heritage and traditions. This free, interactive website helps middle and high school-aged students explore Holocaust history and themes of identity and personal responsibility. Featuring first-person accounts of young people who survived the Holocaust, Coming of Age integrates compelling videos, narratives, and primary documents with online discussions and engaging activities. Coming of Age provides a meaningful and relevant curriculum through: videos of Holocaust survivors sharing their stories; artifacts and primary sources for investigation; writing, history, and geography activities; moderated online student discussions; and timelines and maps. Coming of Age is aligned with the National Standards for World History and NCTE Standards for the English Language Arts for Middle and Secondary Schools. Development of Coming of Age is made possible by a generous grant from the Conference on Jewish Material Claims Against Germany: Rabbi Israel Miller Fund for Shoah Research, Documentation and Education. Additional support provided by The Slomo and Cindy Silvian Foundation, Inc. The Living Museum provides students at Jewish schools with the tools they need to uncover their family heritage through the heirlooms found in their own homes. Through this engaging project, students come to identify with their past, while learning about how it helped to shape them as individuals and as Jews. The program combines a Museum visit, classroom workshops, and independent intergenerational learning. The culminating event is the presentation of a mini-museum curated by students at their own school that highlights their Jewish heritage and community. The online Living Museum enables teachers and students to upload the images and texts of their class’s Living Museum exhibition to the Internet to create a virtual exhibition that can be viewed the world over.